VSim facilitates the real-time exploration of highly detailed, three-dimensional computer models in both formal and informal educational settings. This NEH-funded software addresses the greatest challenge for building knowledge through use of three-dimensional computer models by providing scholars and educators the mechanism to explore, annotate, craft narratives, and build arguments within the 3D space – in essence, facilitating the creation of virtual learning environments that can be broadly disseminated to educators and learners across grade levels and humanities disciplines. 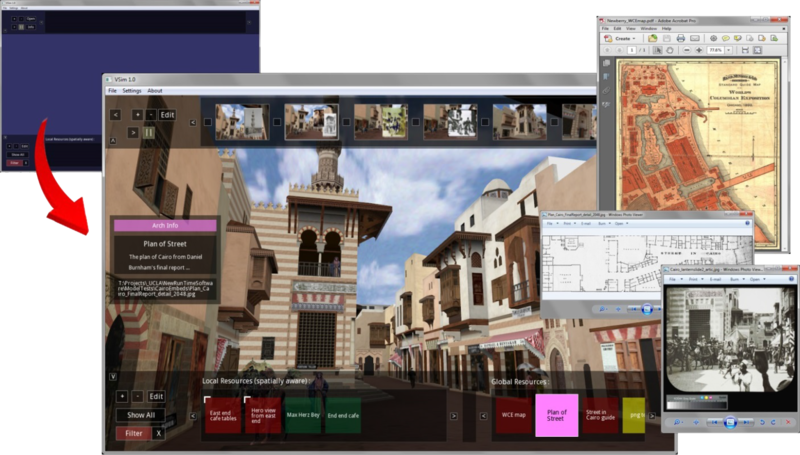 Beyond real-time interaction with three-dimensional content, the software offers two critical functions for academic use of interactive computer models: the narrative section that allows users to create linear presentations within the virtual space (think PowerPoint or Prezi within a three-dimensional world), and the embedded resource section that allows users to embed within the virtual space annotations and links to primary and secondary resources about the modeled environment.